I don't much care for the new hoops you have to jump through to manage your network connections in Vista and Server 2008. 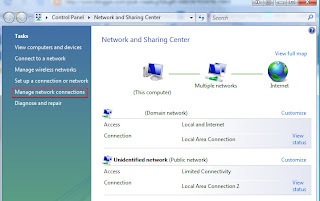 Out of the box you are steered to the Network and Sharing Center whether you right click the network icon in the task tray or click through the control panel. You would then have to click "view status" of the connection you want to manage or click "Manage Connections" on the left side to open the Network Connections folder. While the Network Center may be appropriate for easily turning on network discovery or file sharing, I would much prefer just going straight to the network connections folder. By default Windows hides this folder from direct clickable access. You could type "ncpa.cpl" in the Start search which will take you there, but there's still a better way. 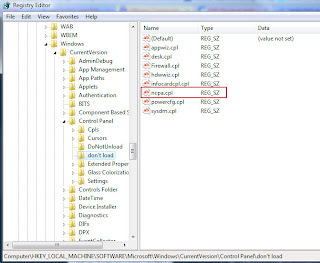 Fire up regedit and browse to HKLM\SOFTWARE\Microsoft\Windows\CurrentVersion\Control Panel\don't load and delete "ncpa.cpl". You should now see Network Connections in your control panel.